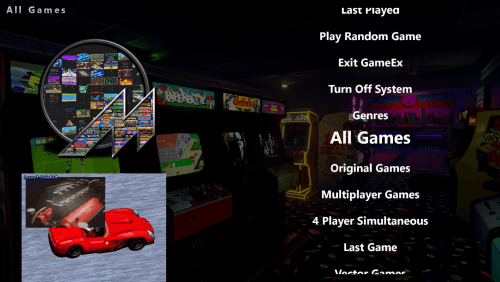 GameEx Arcade Draconus Theme. Create and Unzip to \GameEx Arcade Edition\Themes\Draconus folder. You will need to manually edit your gameex.ini file within the \GameEx Arcade Edition\CONFIG\ folder. Once you have the .ini open, hit CTRL+F and type Theme and change the line Theme=Default to Theme=Draconus. Enjoy! This Version 4 theme is based upon the Samsung Galaxy S5 and the Galaxy Tab Pro 12.2. GIMP .xcf and Adobe Photoshop .psd files provided for the users should they wish to modify the backgrounds of the Tab and S5 images to better suit their systems. The circle logos can be downloaded from the GameEx forum and each pack has corresponding .xcf and .psd files for modification as well. As always, thanks to Tom Spiers for creating and always supporting this great HTPC/Cabinet Front End! Special thanks to my buds Adultery, nullPointer, Headkaze, and KRC for their efforts and to make our community the greatest amongst the retro-gaming FE communities. Also thanks to the forum members for providing input & encouragement in the development of this theme. 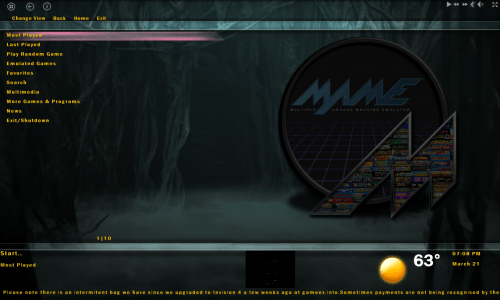 A theme created by Draco1962 designed to run at a resolution of 1920x1080. A theme created by Tom Speirs designed to run at a resolution of 352x256. A variation of the Smoked Glass theme, Star Wars - The New Order was in the works prior to the title announced for Episode VII - The Force Awakens. The theme includes the requiisite fonts and a Star Wars Intro "crawl" (hit ESC to bypass and launch GameEx) along with some Star Wars themed background images. Feel free to replace with your own 1920x1080 backgrounds to make the theme your own. Theme based for the 3D Logo Kit I have been working with. Take your GameEx on a journey...through time! With the TIME MACHINE! I made this to go with my custom cab at home and it will be a nice addition to the overall feel of my cabinet. With that I thought other might enjoy it for a bit of variety with their home setups as well. Check it out and let me know what you think and if anything is broken. As time permits I would like to keep improving the theme so all recommendations are welcome. NOTE: For best FONT display please download and install the "Good Times Regular" font for Windows. I believe this comes standard with Windows 7 but I could be wrong. This is a Version 4 theme. GIMP .xcf and Adobe Photoshop .psd files provided for the users should they wish to modify the backgrounds of the Tab and S5 images to better suit their systems. The Mega Dockelet logos contained are a small part of a larger collection that is forthcoming. GIMP .xcf and Photoshop .psd files are enclosed so that the end-user can create their own custom Mega Docklet logos to further customize their setup. Special thanks to my buds Adultery, nullPointer, Headkaze, and tthurman for their efforts and to make our community the greatest amongst the retro-gaming FE communities. 1920x1080 theme fashioned after XBMC with multiple backgrounds and logos included in the EXTRA.7z located in the MEDIA folder for a varied array of theme combinations. A theme created by RageOn designed to run at a resolution of 1920x1080. A theme created by Crylen designed to run at a resolution of 1920x1080. A theme created by LarryJ designed to run at a resolution of 1024x768. A theme created by djour designed to run at a resolution of 1280x720. A theme created by Adultery designed to run at a resolution of 1620x1024. A theme created by Draco1962 designed to run at a resolution of 1680x1050. A theme created by KRC designed to run at a resolution of 1920x1080. A theme created by NateMac designed to run at a resolution of 1280x720. A theme created by Rychem28 designed to run at a resolution of 1440x900. A theme created by Massop designed to run at a resolution of 1280x720. A theme created by couslev designed to run at a resolution of 1280x720. A theme created by Draco1962 designed to run at a resolution of 1024x768.